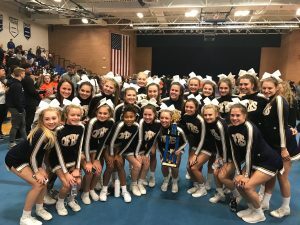 The Olmsted Falls High School Competition Cheerleading team competed at Midview High School on Sunday, October 21st where they performed very well and finished in second place. The team will be competing in the Southwestern Conference Cheerleading Competition on November 5th at North Olmsted High School. Presale tickets can be purchased from the competition cheerleaders and in the main office (all tickets are $6.00). No tickets will be available at the door. Make sure to cheer on the Bulldogs as they compete for the conference title!